Which horse(s) are you taking to the finals? 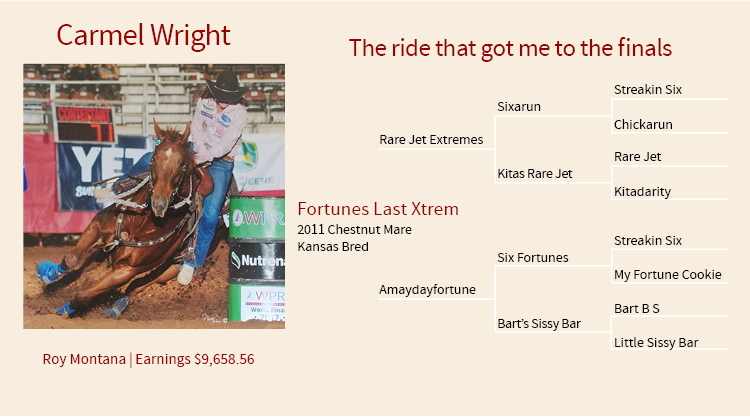 Fortunes Last Xtrem (Luna) the horse that got me here. Reserve Average Champion at the Ram National Circuit Finals. Winning Walla Walla, WA running 17.00 on a standard pattern. also won Sand Point ID, Dillon MT, Othello WA, San Bernadino CA. finishing 21st in the world standings in her 1st season rodeoing. What is your horse(s)' style when running barrels? What special qualities does your horse have and what makes him/her unique? Luna is more a push style, she looks for her barrels. I still have to be a little careful to first as she’s freer running to it, then I have to really ride her after that. She is a big mare, she likes big patterns more, she loves that big run to first an usually really locks on to it. She is very good in small pens too. Luna is not a friendly horse, doesn’t like to be petted. If she doesn’t like something then you’re in for a fight, she has a very tough side to her. She’s a more lazy type of horse, but is usually very solid minded, doesn’t care about too much, which has made her a great rodeo horse. She loves her job. I do a lot of long trotting, some circle work to keep her obedience to rein pressure and cues. Some slow barrel work occasionally if shes running lots. If shes not running lots I do some speed work and sprints to keep her wind up. The life long friends I’ve made. The challenge and excitement of the race. Don’t worry, all you can do is do your best, if it’s meant to be , it will be.